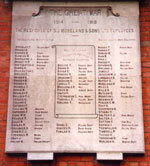 The memorial consists of a plaque, on the rear wall of St. Stephen's Church, Bristol Rd., Gloucester, England. S.J. Moreland were a local company who started life as timber importers but became famous for the production of matches. The response of S.J. Moreland & Sons Ltd. Employees. Limberick A. The memorial is incorrect. His surname was actually Limbrick. Information supplied by John Williams, a relative of Mr Limbrick.